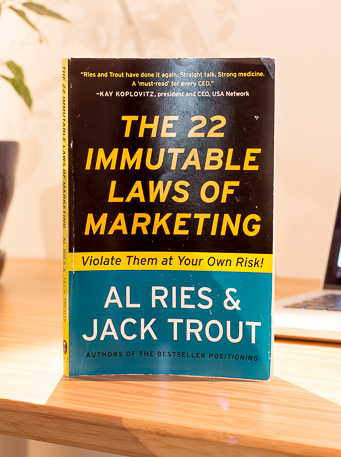 So there is this iconic book on marketing called The 22 Immutable Laws of Marketing, written by Al Ries and Jack Trout. Just finished it and thought I’d give a summary of the so-called “laws.” The book itself is a bit on the old side, originally published in 1993, but some of the predictions are eerily on point! Take Apple and Steve Jobs for instance. There is a law called the Law of Line Extension that states that producing a bigger variety of products to sell more only dilutes your brand. And there is another law called The Law of Focus that says that the most powerful thing in marketing is owning a word in the mind of the prospect. Also, there is The Law of Hype, which predicts that Steve Job’s NeXT computer would be a massive failure (the authors explicitly say so in that chapter). And as we know, NeXT did fail massively. And as we also know, Apple got back on their feet the day they stopped doing lots of things and started doing the iMac instead. So the book is clearly not all hype. Even though a few of the laws have become a bit old since internet has changed the way we can reach out to each other – and at what cost. You’ll see. Because it is easier to get into the minds of your potential clients or costumers first, than it is to convince them that you are a better choice than the one that did get there first. Don’t ask yourself how you are better than the competition; ask yourself in what category you can be first. The example from the book is beer. A high priced imported beer (Heineken) was a huge success. New category? High priced domestic beer (Michelob), even greater success. This law modifies the Law of Leadership with a clearer definition of where exactly you should be the first. And that is within the minds of your prospects. Which is not always the marketplace. So it’s sort of the same as #1 but with a “the race is not over if they launch”-kind of thing attached to it. They say it’s the ultimate sacrifice, because in order to achieve it you have to put all your efforts into one single product or notion. But the reward is worth it, because if you manage to get your name associated with that one word, you are the go-to guy/company for that one word. Examples in the book: “overnight” for FedEx, and “drive” for BMW. So basically #5 is a way to achieve #3. And there is no reason to try to get your name to replace the name that is already in the minds of the prospects, because you can’t change people’s minds once they are made up. What is more, going for that word often ends up reinforcing the position of your competitor as you show the importance of the word itself. If you are not on top, admit it to yourself and to your customers. And work that to your advantage. Example: Avis was number two (beneath Hertz) in car rentals. They acted like number one and lost money for 13 years. Then they switch advertising to “Avis is No. 2 in rent-a-cars. So why go with us? We try harder” – this made them (more than) profitable almost immediately. Examples from the book: Burger King and McDonalds. Coke and Pepsi. Kodak and Fuji. Nike and Reebok. And on a distant third place we have a company way fewer people have heard about. But the authors also suggest that these market shares are unstable; the leader will lose shares as the runner up will gain. And that a new number three pops up every now and then as the old number three goes out of business when it looses the battle against number 2 and number 1. Although this is a problem most companies will never have. In realizing in what way the leader is strong – the essence of it – you can turn this strength into a weakness. How? There are two types of people, those who want to buy from the leader and those who don’t. Find a way to appeal to the latter by highlighting how you are the opposite of the leader. The marketing arena is an ever-expanding ocean of categories, for the reasons mentioned above. But also because we invent new things, variations of a predecessor that better meet the needs – as the needs themselves become more specific as a consequence of the predecessor existing in the first place, or advancements in other fields. The long term-effects of marketing are often the opposite of short-term effects, and the example used to illustrate the point is the use of sales. In the short run, lowering prices increase the business, but in the longer run it educates people into only buying when there is a sale. Short-term gains mean long-term losses. The reasoning here is that you can’t be all things to all people, and that it isn’t really the brand name that is stuck in people’s minds, but the product itself. Which means that when you put your name on another type of product, people will not automatically buy it. But if you focus all your efforts into making one product fantastic, you have a much better chance of building a position in the prospect’s mind. The opposite of line extension. By sacrificing “product lines, target market and constant change” you increase your chances of doing one thing (or something) very well, to a dedicated group of people. And have them remembering you. Example from the book: Fed Ex. When the other shipping companies tried to ship every thing in every way, Fed Ex focused on small packages overnight. Today they are doing pretty well. This is basically law #1, #2, #5, #6 and #9, but framed around the selling point of your product. Or “the attribute” as the authors call it. The goal is to own the selling point, and if your specific selling point is already taken, the advice from the authors is to find a new one (just as with law #2, where you invent a new category to be first in), or have a really, really, low price. The idea here is to first admit something negative, and then spin that into something positive. The reason why it works is because it is so unexpected, and therefor very disarming. And since you were so honest people are likely to believe what you say next. But keep in mind that it has to be something that is generally viewed as negative, otherwise people will just think that you are weird. There is an idea floating around that if you just put enough work into something it will work out eventually. This is wrong, according to the authors. At least when it comes to marketing and war (which for some reason is mentioned quite a lot in this chapter). The reasoning here is that there is always something that your competitor is expecting the least, and that this is your opportunity for one single, bold stroke. In other words, be strong where the competition is weak. Again a law that is very focused on what your competitors are doing (and not on your costumers per se), but anyway, the point here is that long-term planning doesn’t work because you can’t predict the future. What the authors want you to do is some creative short-term planning and turn that into a long-term marketing direction. Yes, I know, it sounds like planning. But they insist it is not. “Ego is the enemy of successful marketing. Objectivity is what’s needed.” And according to the authors, you lose your objectivity by having your ego inflated by success. They don’t have a problem with having a big ego, as it can be a very useful drive, but in order to succeed with your marketing you still need to know what is going on in the real world – and not cling to your imaginary world of being a golden god. They mention Donald Trump in this chapter. You will fail, and when you do, realize it and accept it quickly. And move on to the next approach. But why engage in crazy risk-taking? Why not just play everything safe? Because in marketing and business, it’s hard to be the first without sticking your neck out. And being the first in one way or another is, as mentioned in the first couple of laws, a good thing. The message here is that you shouldn’t confuse a fad with a trend. A fad is something that is popular on a shorter period of time, whereas the subtle onset of a trend can even go unnoticed, but keeps on gaining momentum. The authors compare the two to a wave and a tide. And the point is that if you want to build something, as opposed to make a quick buck or two, you should center your marketing or business on a trend and not a fad. In 1993, before you could message anyone without knowing them first or build a following of tens of thousands of people without spending anything but your time and energy, you couldn’t get anything of the ground without a lot of money. And although a lot of money certainly helps, you are now living in a digital age with a completely different set of rules. Think about that instead of the ginormous ad-budget you don’t have. …So, that was my summary of the 22 immutable laws of marketing, hope you got something out of reading it! Personally I think they way to go is to pick a few of the laws that really resonates with your core values and your business, and make the most of them. Ok. Now go and market your thing!